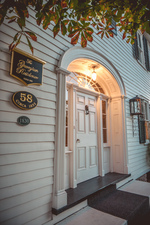 The Georgian Residence luxury Boutique Suites. One of a select dozen in Ontario, awarded 5 star by the Federation of Ontario Luxury town house has prime location in the Heritage District of N.O.T.L. This Historically Designated (1830) home could not be better located for every kind of experience, theatre, shopping, galleries, wineries, dining, golf and lake. Makes this a great base for shopping weekends, culture trip or for adding a little pleasure onto your business affairs. 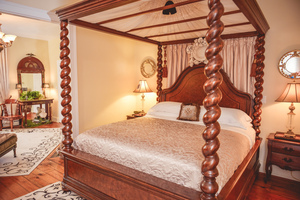 All three master suites have a luxurious and serene space with original wood burning fires for snuggling up for a romantic getaway, With European drama and charm that will lure you in. Romantic King Four Posters bedrooms, private lounges and private en-suites.,2 Plasma t.vs, free Netflix, free Wi Fi, coffee machines, fridges, i pod docking stations. Please note rates are based on accommodation only. Fine European Antiques compliment this Georgian Town House. Enjoy relaxing by the private enclosed pool on those hot summer days. 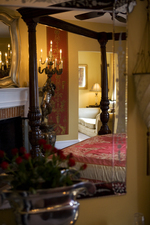 Part of the charm of The Georgian Residence is that although its prime central location - its success is based solely on its word of mouth recommendations. Tarrif is based on accomodation only, no food or alcholic beverages are served on premises.